Discount Miami piano moving service is your one stop for all your piano moving needs. Taking into account that your piano is among your most valuable possessions, if it is damaged while it is being moved, you may have to pay thousands to repair or replace it. That’s why you should seek out professional piano movers who understand how to move it securely and efficiently. We use air ride trucks to transport all pianos and large antiques. Our highly trained piano moving team takes the worry out of your transport needs. With over 10 years of experience, we do it right the first time, and every time! Whether you’re moving your piano locally down the street anywhere in Florida let our professional piano team make it a stress free move. Why Choose Professional Miami Piano Movers? Pianos are valuable and are a major investment. Attempting to move one alone or hiring inexperienced movers is unsafe and could turn out to be a financial set back. Unlike normal furniture, pianos need special attention during the moving process due to their delicate wood frame, parts and sensitive tuning. It only takes a relatively small mistake or drop for expensive damage to occur. Using a professional piano moving company is the first and best solution to protect yourself and avoid costly mistakes. Discount Miami Movers know how to properly prepare and load a piano for transport. 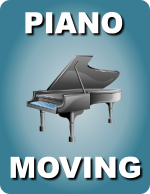 Your piano will get delivered to its new location in a safe and time efficient manner. Discount Miami Movers are fully insured, licensed and bonded in the state of Florida. Our expert South Florida relocation moving team will always strive to surpass all your expectations and provide you with quality service and a peace of mind. We provide all this at one of the lowest prices in town.